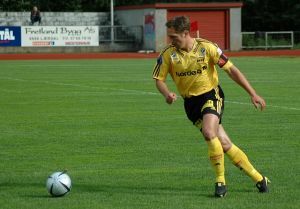 We all know that playing professional soccer requires a big commitment for both physical training and mentally. However, the same is to be said for a food commitment and eating well. How you eat will depend on your performance both on and off of the soccer field; plus before and after the match. Below are some specialized soccer meals for a week. For professional soccer players. Breakfast: 1 cup powdered chocolate milk, breakfast cereals and a banana. Lunch: Spaghetti, Beef filet with potato and tomato, and fruit salad. Snack: Sandwich with ham and an orange juice. Dinner: Vegetable soup, omelet, rice, and apple pie. Breakfast: 1 cup powdered chocolate milk, Toasted bread with olive oil and tomato, and an orange juice. Lunch: Lentils Beans, bread crumb chicken fillet with mushrooms, and a yogurt with sugar. Snack: Peanut butter sandwich and a fruit juice. Dinner: Mixed salad, Salmon in sauce with fried potatoes, and strawberries with cream and sugar. Breakfast: 1 cup powdered chocolate milk, toast with butter and ham, and a fruit juice. Lunch: Rice with vegetables, pork loin steak undressed breaded with lettuce and a yogurt with sugar. Afternoon Snack: Cheese sub or sandwich and an orange juice. Dinner: Mixed vegetables with peas with ham, grilled hen with lettuce and corn, and a yogurt. Breakfast: a glass of chocolate milk powder, biscuits with butter and jam, and an orange juice. Dinner: Mashed vegetables and grilled garlic & shrimp and plain yogurt with sugar. Breakfast: 1 cup powdered chocolate milk, Toasted bread with olive oil and tomato, and fruit salad. Lunch: salad from the garden, rice with squid in its ink, and a custard. Snack: Cottage cheese with honey and a banana. Dinner: Noodle soup, sea bass baked with roast potatoes and two kiwis. Breakfast: 1 yogurt cereal, homemade biscuit, and a fresh orange juice. Lunch: Pasta a la carbonara, veal steak with fresh tomato and corn, and two tangerines. Snack: Sandwich with serrano ham with fresh tomato and a fruit juice. Dinner: vegetable soup, swordfish with mashed potatoes and a yoghurt with sugar. Breakfast: 1 cup powdered chocolate milk, a croissant with jam and a fresh orange juice. Lunch: Fried eggplant, Roasted chicken with mixed salad, and an apple with cheese. Dinner: Cream of spinach soup, Baked chicken with roasted tomato and a natural yogurt with sugar. 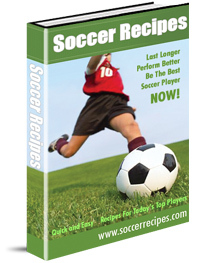 To get more meals where they came from sign up for the Soccer Recipes 5 Day E-Course or buy the ebook! Soccer meals and foods free!